As her husband happily looks on, Adugna breastfeeds her baby girl delivered through cesarean section. Before this joy, the couple had lost four babies who died within the first month of birth. With support from USAID’s HRH Project, Ethiopia’s Federal Ministry of Health is empowering health extension workers and health care providers with skills, confidence and tools to provide lifesaving information and essential surgical services to women and families. Photo by Muradu Melis, Jhpiego. Melekoza, Ethiopia—Adugna Ayele and her husband Endrias Samuel have buried more children than they have living with them now. Of the six children Adugna delivered at home with the help of a traditional birth attendant, four died within the first month of life. The couple live in Melekoza, a district in Ethiopia’s rural Southern Nations, Nationalities and People’s Region (SNNPR). In this region, eight out of 10 pregnant women give birth at home. Health facilities are far, and people are poor. Also, many women and families in SNNPR lack basic health information on the importance of visiting a health care provider during pregnancy and giving birth at a health facility with a skilled nurse or midwife. Rates of birth-related complications like excessive bleeding, obstructed and preterm labor, baby asphyxia and deaths (of the mother and newborn) are high here. For Adugna and Endrias, the deaths of their children are a mystery. “We do not know why our babies died so young,” they say. According to the World Health Organization, nearly half of deaths among children below five years of age occur in the first 28 days of life, known as the neonatal period. Research has shown that most of these deaths can be prevented if a skilled health care provider is present at delivery and immediately after birth. The Ministry of Health is working to bring basic childbirth-related information to couples in rural and remote areas of Ethiopia. With funding from the U.S. Agency for International Development (USAID), the Strengthening Human Resources for Health (HRH) project supports the Ministry in recruiting and training community health workers (known as health extension workers) to serve communities like Melekoza. The project also supports the provision of basic medical supplies and equipment while empowering health training institutions, health care providers and hospitals to provide critical surgical services, such as cesarean section. 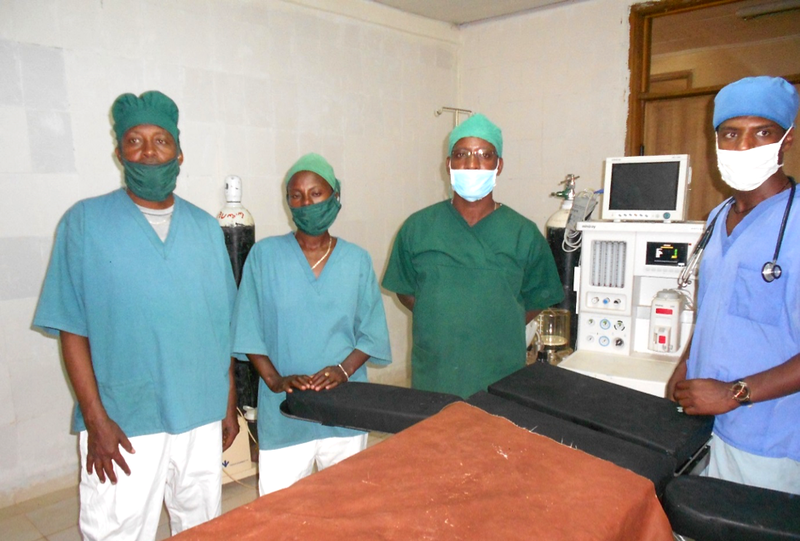 For example, the HRH project helped Wolaita Sodo University expand enrollment and improve the quality of training provided to anesthesia students and surgical support cadres. Since the Project started five years ago, more than 28,000 health extension workers, midwives, anesthetists and related cadres graduated from Wolaita Sodo and 50 other HRH-supported training institutions to join Ethiopia’s health workforce. These skilled providers and the health facilities they serve are bringing high-quality health care to previously underserved communities. This setup also ensures a continuum of care from the community to the health facility, and vice versa, while providing comprehensive surgical care services. Getnet Tadese, 28, is one of 45 new anesthetists who benefited from this partnership at the university. After graduation, Getnet joined Laha Hospital, which acts as a referral facility in Melekoza. When he landed at the hospital, his first task was to revive the anesthesia unit—inactive for five years—in the hospital’s operating room. In addition to overseeing the installation of the anesthesia machine that had long been idle in the operating room, Getnet ensured a steady supply of essential anesthetic drugs to support surgical procedures. “The operating room started its functions with full effort in August 2016,” Getnet said proudly. Meanwhile, about 30 kilometers from Laha Hospital, Adugna learned she was pregnant again. Within a few weeks, a health extension worker knocked at her door while conducting routine home visits to pregnant women and mothers in their villages. After noting Adugna’s details in her record book, she counseled the couple on pregnancy danger signs, birth preparedness and antenatal care. After also discussing the benefits of giving birth at a health facility and essential care to the newborn after birth, she gave them her mobile number for emergency contact. Laha hospital surgical team with the revived anesthesia unit. After being dormant for 5 years, the arrival of Getnet Tadese (right), an anesthetist trained with the support of the USAID HRH Project, and Haptegeorgis (center, with glasses) led to the resumption of lifesaving surgical services, such as caesarean section, at the hospital. Photo by Muradu Melis, Jhpiego. When Adugna started having contractions, Endrias called the health extension worker. Upon her arrival, she determined Adugna needed to go to the hospital and immediately contacted Laha Hospital for an ambulance. Upon Adugna’s arrival at the hospital an hour later, Haptegeorgis Kifle, the medical director and surgeon on duty, examined her and found that her baby was lying in an abnormal position. Delivery of the baby through the birth canal was unlikely and unsafe. Adugna needed immediate surgery. Haptegeorgis, Getnet and their colleagues in the operating room prepared for surgery using the anesthetic unit Getnet had revived. Soon, Adugna welcomed her newborn, a baby girl, successfully delivered by cesarean section. Adugna is just one of the 203 surgical patients who were treated at Laha Hospital in the first six months after restoration of anesthesia services. “So far, we have not faced [major] cases of post-anesthetic complications,” said Haptegeorgis. He also noted that the number of pregnant women coming to deliver at the facility has increased. After the baby’s birth, Adugna was confident that with the health extension worker’s continued visits, she would have the information and resources to help her baby girl grow and thrive. Health extension workers educate families with health information that includes the importance of exclusive breastfeeding and taking children to the clinic for immunizations; advice on nutrition, hygiene and sanitation practices; and how to prevent and control deadly infections such as diarrhea and malaria. Today, Adugna and Endrias’ daughter is five months old, growing healthy and strong. The USAID-funded Strengthening Human Resources for Health Project is led by Jhpiego with partners Management Sciences for Health, the Ethiopian Midwives Association, the Ethiopian Association of Anesthetists and the Open University of Ethiopia. Jhpiego’s Muna Ahmed, Charles Wanga and Ann LoLordo contributed to this story.